So customer Ryan came by the store on Thursday with the above gift for me…a full page pencil drawing of Swamp Thing that he drew. He said “I began to realize that you kind of like Swamp Thing, so I thought I’d do this for you!” That was very nice of him. I actually have a bunch of art in frames ready to hang up, I just haven’t found time to do so yet…I do have this piece by pal Matt on display, but I’ve got several others that need to go up. Someone remind me to do so. Also, I may need to redact part of my post from Wednesday, in which it turns out the extra story pages only present in the variant’s variant (sigh…) are in fact preview pages from the next issue, so readers won’t miss out on any material. It was just a little something extra to give me a headache for the lucky fan who was able to get their mitts on it. Anyway, glad I moved my copies already. I’m not sure how I’m going to edit that post, but I’ll put an explanation at the top so they’ll know to take my rantings with a grain of braaaaiinnns. Thankfully nobody reads blogs anymore, so I didn’t get many complaints. 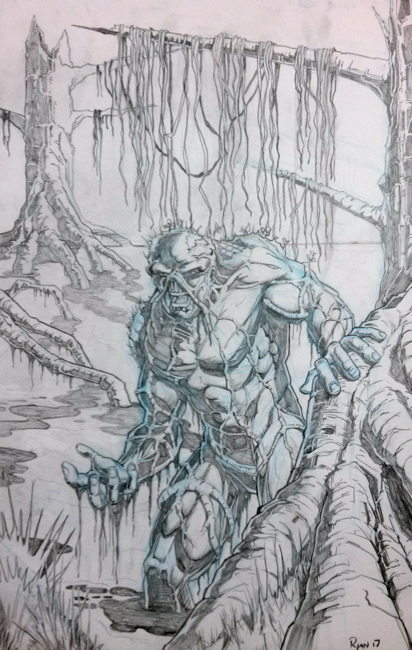 In Patreon news…I will have a new installment in the Swamp Thing-a-Thon up soon. I’m just retooling the format a bit, oh, and also trying to find time to write it, which hasn’t been easy of late. I didn’t give up, I’m just a wee bit behind. I’m attempting to make the process a little less time-consuming, so that a biweekly schedule won’t become an enormous burden. I’ll let you know when the new one is up. And in news that’s not all me me me me me me, Bully, the Little Funnybook-Pricing Bull, and his pal John are selling comics to support good causes! Plenty of photo evidence at the link! If you’re in the area, why not drop by and pick up some great comics at low, low, low prices…and that’s no Bull(y)! Replacing the ads and letters pages with a preview for the next issue? I realize the idea behind these gimmicks is to just sell variants, but that seems like kind of a waste.